- 4" ID PVC pipe, cut into the following lengths: 5¹ 10.125", 4¹ 10.125", 3¹ 10.125" and 2¹ 10.125"
The PVC toilet mounts are affixed (using the lag bolts) to the exact centers of the 1.5 foot square sheets of plywood. Each length of 4 inch ID PVC pipe is then attached to the toilet mounts (one per mount) with the PVC glue. Next, drill four holes (90 degrees apart) in the 4 inch ID PVC cap. Mount (using the PVC glue) the two 0.5 inch lengths of 1.25 inch ID PVC pipe into two opposing holes. Make sure the two lengths of pipe are mounted flush with the outside of the PVC cap. Slide the 7.5 inch length of 1.25 inch ID PVC pipe through one of the remaining opposing holes, seating it through the opposing hole (mounting it with the PVC glue) and flush with the outside of the PVC cap. The edges of the above pipes can be sanded to give a better appearance. 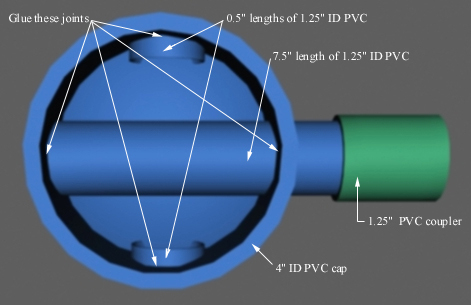 Mark the tops of the 4 inch ID PVC pipe in 45-degree increments, choosing one face each as the zero point. Imprint the cap assembly with an indication, near the bottom edge, with a sighting line. Mark the protruding end of the 7.5 inch length of 1.25 inch ID PVC pipe in 45-degree increments. Making sure that the lines are longer than 1.5 inch long. Sand the inside of the 1.25 inch PVC threaded coupler, so the friction is reduced between it and the 7.5 inch length of 1.25 inch ID PVC pipe. Then sand one side of the 1.25 inch PVC threaded coupler flat (in order to mount the tracker later). Affix Velcro to the flat area. The image below is a graphical representation of the instructions for constructing the rotating cap of the CAVE measuring device.